The Kawarthas is a recreation area with lakes, canals and rivers all connected by the Trent-Severn Waterway that provides passage for both pleasure crafts and commercial vessels. Peterborough and Lindsay are key cities in the region. Peterborough boasts the world's largest hydraulic lift lock on the Trent-Severn Waterway. To learn about First Nations history check out Serpent Mounds Park, 30 km southeast of Peterborough. Further history can be learned about canoes at the Canadian Canoe Museum in Peterborough. Lang Pioneer Village was created in 1967 to preserve the rural history of the Peterborough area. About 35 km north of Peterborough is Petroglyphs Provincial Park near Burleigh Falls with 900 pictographs carved into white marble rock face 1200 years ago. Lakefield justifiably has the Lakefield Literary Festival in mid-July to celebrate the bevy of Canadian authors that lived and/or wrote in the area: Margaret Laurence, Catharine Parr Traill, Susanna Moodie and more. 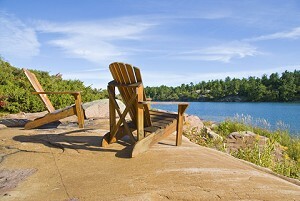 Kawartha accommodations include hotels, motels, bed and breakfasts, campgrounds, cottages and cabins.